I've been well aware that Cooper's Hawks have wonderfully adapted to life in suburban Ohio. In fact, most of my neighbors think that a peregrine falcon prowls "our hood". Moving to buteos, I would occasionally hear the shreaks of red-shouldered hawks at my parents house in Summit County, but their neighborhood street lies next to a large wooded ravine complete with stream. 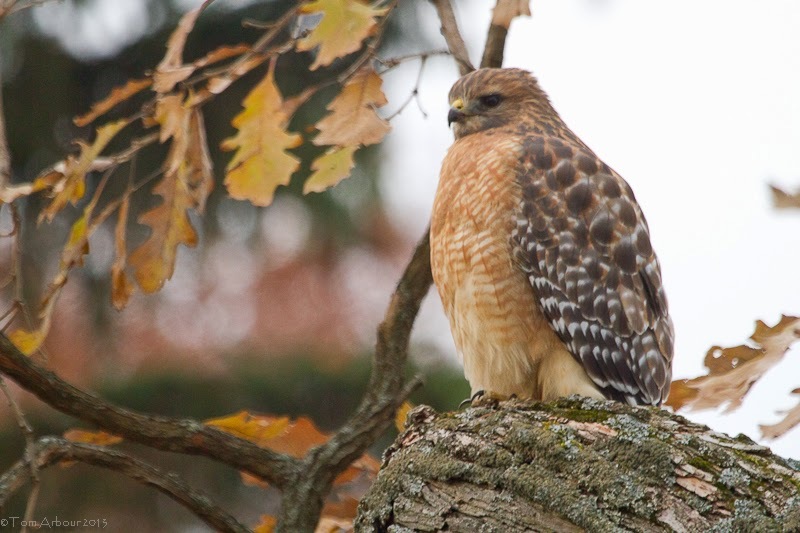 A few years ago, I began to see and hear red-shouldered hawks in our Worthington neighborhood. Relatively densely populated, but with plenty of mature trees that have grown up since the late 1950's, red-shouldered hawks now prowl the area. Megan and Brody spotted this one early today. Have you seen an increase in red-shouldered hawks in your "neck of the woods"? Ron, I can't say that i've ever thought about a hawk taking out a dog, but I suppose it is quite possible. We often find various parts in out backyard, seemingly dropped from the tree, that used to belong to live animals. The most recent find was the head of a red-bellied woodpecker. We've got quite a few Red-shouldered Hawks in our 812-acre suburban preserve in the northern Piedmont, Tom, but they're still outnumbered by Red-tailed Hawks. Scott- Interesting. The red-tailed hawks are common out in the open areas, especially just a half-mile north of here along I-270, but they stay clear of our relatively wooded neighborhood. The red-shouldered hawks, though, don't seem to mind the trees and lack of sight lines that red-tailed hawks seemingly require. Cooper's hawks are still the most commonly seen hawks in our neighborhood.